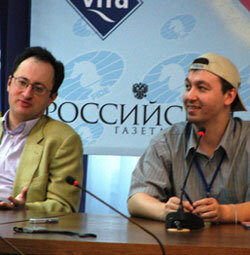 Gata Kamsky drew his first game in his six-game match against Boris Gelfand at the Candidates Matches in Elista (June 6-June 14). If Gata wins again in the second round (he defeated Bacrot in the first round), he will advance to the World Championship in Mexico (September 12-20). Kamsky combated Gelfand's Najdorf Sicilian with the tame classical variation, and conceded a draw after 20 moves. According to Grandmaster Pascal Charbonneau (who lives in the same neighborhood in Brooklyn as Gata! ), "Kamsky needs to play something more aggressive to bother Gelfand, who is so well prepared in the Najdorf Sicilian." CLO spoke to Gata in his cottage in Chess City, Elista. Gata is relaxed, comfortable and happy for the support of American fans. The Elista public also support and remember Gata from his 1996 match against Karpov in Elista. Tomorrow Gata plays round 2 at 7 AM EST. Check out the official website.